Perfect accent for any sea farer. 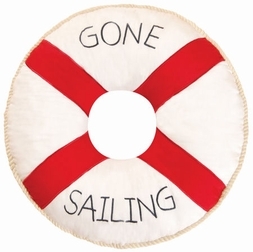 Cotton decorative pillow features a nautical design of red on white, embroidered navy blue "Gone Sailing" letters, and trimmed with a rope edge. This 16" Round Pillow has a whimsy life preserver shape that will be perfect displayed on your sofa, aboard your boat, or in your bunk!